Every year in America, over 600,000 new businesses start up and hire their first employees. Many will fail, but some of them will become the legendary businesses of the future, transforming industries and making millions for the angel investors who helped fund them in their early days. Angel investing, once the exclusive province of multi-millionaire high-rollers, has now entered the mainstream, with more than $20 billion being invested annually by individual investors in the US alone. Contrary to popular belief, access to these high risk/high return investments-and success in startup investing-doesn't have to be a matter of luck or connections. Angel Investing: The Gust Guide to Making Money & Having Fun Investing in Startups shows how smart investors with the right strategy and a long-term perspective can achieve annual returns of 25 percent or more from a well-designed angel portfolio. 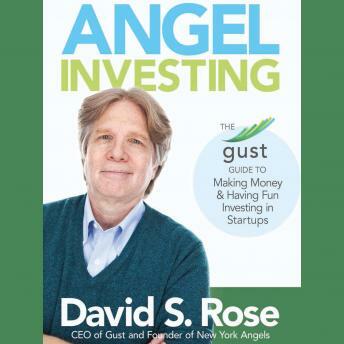 Written by David S. Rose, the founder of Gust-the global platform that powers the world of organized professional angel investing-Angel Investing is a comprehensive, entertaining guide that walks readers through every step of the way to becoming a successful angel investor. It is illustrated with stories from among the 90+ companies in which David has invested during a 25 year career as one of the world's most active business angels and includes instructions on how to get started, how to find and evaluate opportunities, and how to pursue and structure investments to maximize your returns.